The Vigor2862Lac router has a SIM card slot for a FDD/TDD LTE/4G category 4 mobile broadband modem. The 4G/LTE SIM card slot allows you to insert a SIM card from your service provider and have Internet access without the need to use additional hardware. It is protected by a cover. The Vigor2862Lac router has 2 LTE antennas. A 1 metre extension lead with a magnetic base allows the antennas to be placed in the best position for optimum 3G/4G reception. The Vigor2862Lac router supports 4 types of WAN Interfaces, including an ADSL2+/VDSL2 WAN interface, a Gigabit Ethernet WAN interface, a USB port for a supported USB 3G/4G USB modem, and a card slot for LTE 4G/LTE modem. Additionally the Wi-Fi WAN can be tethered to a Wi-Fi hotspot such as a 4G Wi-Fi modem for Internet access. The Vigor2862Lac has 4 x Gigabit LAN ports and supports with 50,000 NAT sessions. The Vigor2862Lac supports both port-based and 802.1q tagged VLANs. Port based VLANs allow the assignment of a VLAN and IP subnet to each router LAN port. On the other hand, 802.1q tagged VLANs can extend up to 8 VLANs and the IP subnets to an attached switch. The Vigor2862Lac has a built-in IEEE802.11ac Wave 2 dual-band wireless for speeds up to 1.7Gbps providing good coverage and excellent Wi-Fi performance. The IEEE802.11ac Wave 2 allows up to 4 Wi-Fi clients to simultaneously have full speed over the wireless network. The MIMO technology (4×4) with diversified antenna arrangement minimises interference effects and ensures good wireless performance. To match the business level features of Vigor2862L series, Vigor2862Lac supports all major Wi-Fi encryption protocols: WEP, WPA, WPA2 and 802.11X, plus MAC Address access control, and DHCP Fixing to prevent unauthorized accessing. The Hotspot Web-portal (log-in) provides four profiles to allow guest users to log in to the wireless network by using their social account (Facebook or Google) use a PIN code issued via SMS. 8 x SSID’s are available (4 for the 2.4GHz band and 4 for the 5GHz band). Each of the SSIDs can be created and assigned to a VLAN and IP subnet with separate security levels. The wireless VLAN function lets you isolate wireless clients from each other or from the “wired” LAN. QoS functions allow the network administrator to set priorities for certain types of traffic to guarantee the required level of performance for data flow. For example, real-time traffic such as VoIP or Video over IP can be prioritised as these have less tolerance over delays caused by network congestion. The Vigor2862Lac has powerful firewall features including object-oriented SPI (Stateful Packet Inspection) firewall, DoS (Denial of Services), CSM (Content Security Management) and WCF (Web Content Filter). Vigor2862Lac supports up to 32 simultaneous VPN tunnels, of major protocols such as IPSec/PPTP/L2TP, including 16 SSL VPN tunnels protocol. The dedicated VPN co-processor supports the hardware encryption of AES/DES/3DES, hardware key hash of SHA-1/MD5, and LDAP authentication, and ensures that VPN traffic is secure and performance is maximised. The SSL technology allows secure Web encryption such as those used for on-line banking. With Vigor2862Lac, you can create SSL VPN in Full Tunnel mode or Proxy mode. Furthermore, since the Vigor2862Lac supports multiple WANS Ethernet and 3G/4G, you can create VPN Trunking for VPN Load Balance and VPN Backup. For instance, you can use a number of connections to a site to increase the bandwidth, or have a backup connection when the primary connection fails. Instead of normal method for VPN connection through web browsers, Vigor2862Lac supports Central VPN Management (CVM) which utilises TR-069 protocol. You can create VPN tunnels with just a few mouse clicks on the icons representing your local network (e.g. public places such as a café) and remote locations (e.g. branch or home office), and the router will establish the connection automatically. This takes away the tedious process required for VPN tunnel creation. Vigor2862Lac supports Central AP Management (APM) with a console to auto configure and manage up to 20 directly connected (via LAN cables) Draytek wireless Access Points including VigorAP 800, VigorAP 810, VigorAP 900 & VigorAP 910C. 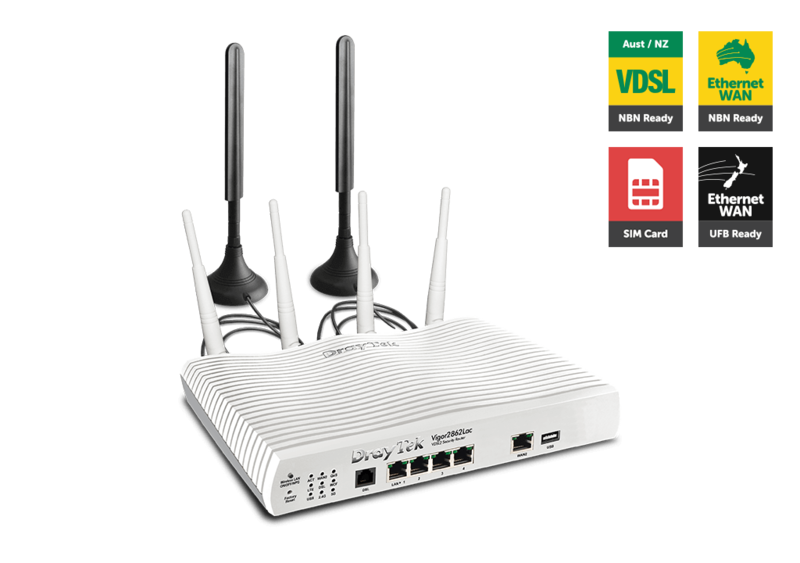 The Vigor2862Lac includes a number of management options to provide both local and remote access to monitor and manage the router. The TR-069 feature integrates with the VigorACS 2 centralised management system. This can be used to allow system integrators or network administrators to configure, monitor and manage the Vigor2862Lac remotely from the comfort of their offices or homes. It can also be used to Auto-Provision the Vigor2862Lac remotely by sending configuration data to the router. There are 3 wizards: Configuration Wizard, VPN Wizard and Firmware Upgrade Wizard. These allow network administrators to quickly and easily carry out complex tasks. Like all Vigor routers, Vigor2862Lac supports management options include HTTP, HTTPS, FTP, SSH, Telnet and SNMP. High Availability mode in the Vigor2862Lac router provides hardware redundancy in the network by the use of one or more Vigor2862Lac routers in a group that can be configured for Hot-Standby or Active-Standby. High Availability is essential in mission critical applications where the network as well as Internet connectivity needs to be available 100% of the time. Should a hardware failure occur in the primary router, the standby router will immediately come on line to provide uninterrupted network connectivity. WCF License share (Hot-Standby only): Network administrators can create a High Availability group on MyVigor website and include at most 8 routers to join the group and share the same WCF license. Only 1 router (the primary) can use the license at a time, and when the primary router goes down, the secondary router will come up and register to MyVigor server and continuously provide firewall protection to LAN clients. It means only one WCF license is required per High Availability group. Configuration Sync (Hot-Standby only): Every configuration/modification made on the primary router will be synchronized to the other group member(s) ensuring that network functionality is identical should the primary router fail. DDNS Update:For dynamic WAN IP users, High Availability group members can share the same DDNS account, that when secondary router become primary, it will update the DDNS profile so the network can still be accessible via the same DDNS domain. One ideal application of either the Vigor2862Lac or Vigor2926Lac routers is to provide internet access for passen-gers on public transport such as tourist bus or coach. For the transport company to provide free Wi-Fi access for its passengers, the wireless router can be placed in a suitable location on the bus to provide good Wi-Fi coverage throughout the bus. On larger busses or double decked busses, you can install a Wi-Fi access point such as the VigorAP 902 to extend the Wi-Fi coverage. The passengers can be given unrestricted access to the internet, or the User Management feature in the router can be used to issue usernames and passwords for the passengers to prevent unauthorised users outside the bus from getting free internet access. In addition, users can be directed to the company web portal for information on the services. Other security measures that can be implemented are the use of the ﬁrewall and Content Security Man-agement (CSM) to protect the users from undesirable website contents (eg. for under aged passengers). For your inter-oﬃce communication needs, you can set up VPN connections over the 3G/4G network to share network resources such as ﬁles and servers. To protect your network, you can conﬁgure the Object-oriented SPI Firewall, DoS defense, CSM (Content Security Management) and WCF (Web Content Filter) as required. Addition-ally, the VLAN feature allows up to 8 workgroups to be set up to add further security and to provide diﬀerent levels of network access based on the workgroup. 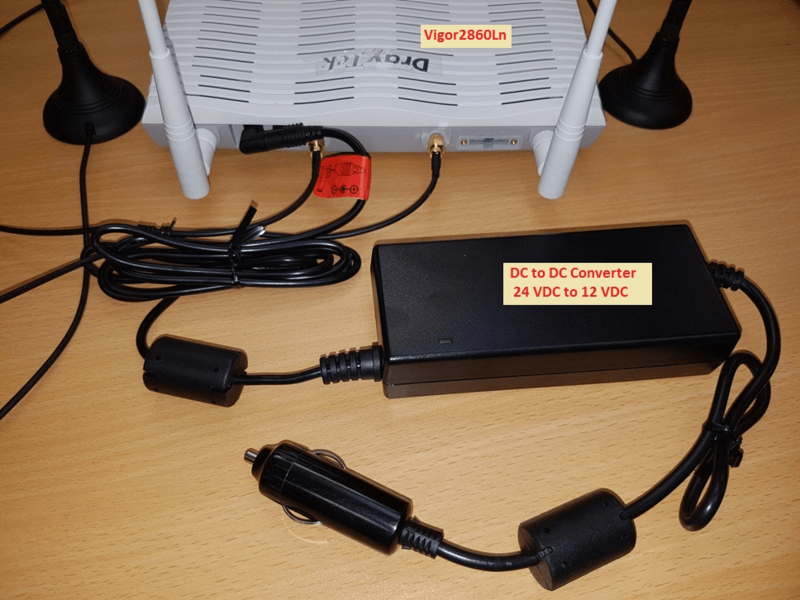 Vigro2862L and Vigor2926L routers require a 12–15V DC power supply. Therefore when used in vehicles such as busses or trucks which have a 24V supply, you will need to use a DC to DC converter to produce 12VDC regulated output. These converters are available from electronic suppliers. They plug into the cigarette lighter socket in your bus or truck and have an output socket that plugs into the router. It is recommended to also use the DC to DC converter when the router is used in a motor vehicle to ensure a constant voltage to the router. Although a 13.8 volt car battery output is still within the router’s power supply requirements, the voltage may fluctuate to outside the router’s requirements. 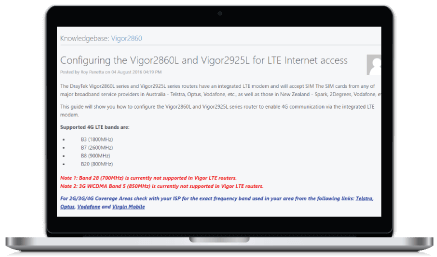 This application note will show you how to configure the Vigro2862L and Vigor2926L series routers to enable 4G communication via the integrated LTE modem.